Born in 1972, Purwa is a young artist from Sanur in Bali who wants to comment on various problems he sees around him. 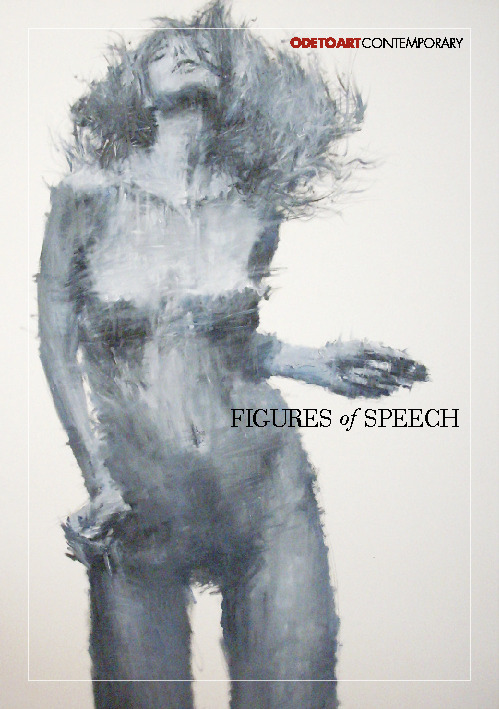 Through these male figures, Purwa presents the problems he addresses using body language and gestures showing screams, sadness, fear, hunger for freedom and so on. 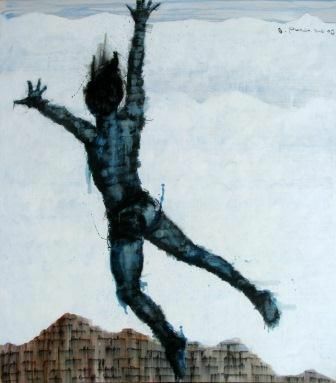 The body of the man in his paintings keeps on moving and dancing - even when he is not moving his bodily gestures as depicted by the strong musculature always suggest movement. 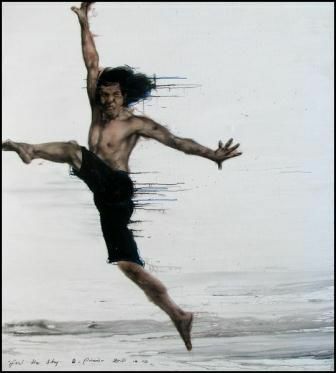 For the past few years, Ib Putu Purwa has enjoyed painting burly male figures that move and dance with unique gestures and body language. In the realm of art, physical bodies are closely attached to the dimension of history, and for centuries they have been explored in various works of art. During the golden age of Greek civilization, man was obsessed with presenting realistic visualizations of the human body. It started with Samaticus inviting stone carvers from Egypt, who crossed the Mediterranean and created the sculpture Kritean Boy. Polykleitos was regarded as one of the greatest sculptors in the High Classical Period of Greece and insisted that the body parts of sculptures should be linked by perfect mathematical proportions, a system which was then appropriated as standard bodily proportions and references for sculptors for generations after. During the Renaissance, there was a revival in Michaelangelo's explorations and an in-depth study of anatomy by Leonardo da Vinci. The Riace Bronzes were two sculptures of men, rendered very realistically in ancient Greece; these sculptures presented for the first time a realistic representation of the human body in dynamic positions of athletes. Although these were standing statues, their design was not static at all, they suggested movement. Exploration of bodily movement, particularly that of male bodies, is closely related to the historical development of art; the human body had always had a strong attraction for artists who liked to present them in their works. Throughout history, the obsession of the human body had been closely related to the development of civilization, and usually men attempted to present their bodies as more human than human. Perhaps Purwa, too, finds himself in such a position. With his depiction of athletic male figures with burly bodies, sometimes wearing clown masks, these figures are playing a role and acting out fragments of life. Athletic figures represent perfection and a tendency to position the body in an attractive manner, which is in fact full of shortcomings. Bodies in Purwa's works play a role in representing the restlessness they feel, these bodies take on the role of actors to translate Purwa's intention. The representation of male bodies in a sociological context also indicates the issue of power that is mostly patriarchal, but the issue of power is not what Purwa intends to put forth. The male figures in Purwa's works are depicted in an ambiguous manner, as men who do not demonstrate power, but instead wear clown masks of pretension.